A getting started guide for choosing the right platform for your coworking space website. The coworking world is complicated. Among the community, facilities, sales, and operations, you need to deal with software challenges too. Building your web presence (and mobile) should be and probably is your number one priority when it comes to software. We talk to a lot of coworking spaces, and we observe a lot of great websites and some that are not so great. 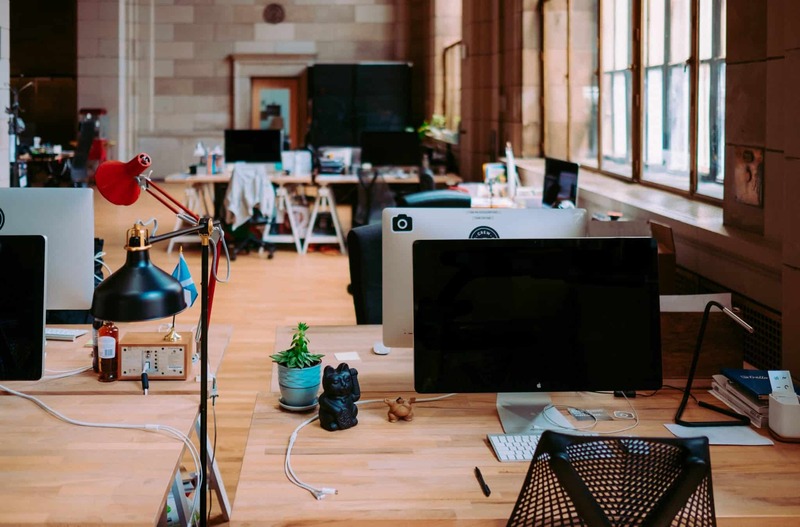 Here are our observations and recommendations for setting up your Website and how you can integrate it with your coworking management software of choice. The first and most important part of your web presence is building a beautiful marketing website. The purpose of the Marketing website is to convince new members that your space is great and it will solve their office problems. It has to improve your sales results by “converting” more of the people that noticed you to prospects that are knocking on your door for a tour. You need great content and visuals that are laid out well in a logical way that conveys the benefits of joining your space. Easier said than done. It should be modern, beautiful and sleek. It should be easy for you to write and edit content. It should be easily extendable with themes, plugins, and widgets. It should be built with a standard technology/solution that is well adopted, so any web developer can support it. Google must love it. SEO is key. Popular Website builders are ok (such as Wix). Standard CMSs (Content Management Systems) are always better (such as WordPress and Squarespace). Custom (not-standard) CMSs have many flaws such as: hard to maintain, lack of extensibility and lack of general adoptions/knowledge. Custom built websites ‘from scratch’ are also not a good option. It costs a lot to built a website from scratch, it is hard to maintain, it’s not extensible, SEO is hard to achieve (and many other problems). Coworking Management Platforms (or any other management platform) that offer built-in websites are the worst. The resulting website is not standard, not extensible, not easy to maintain, to customize… The SEO won’t be good enough and also, it will always be outdated and not according to the latest UI/UX standards. Clearly, the best option for building a marketing website for a coworking space is to either choose a website builder such as Wix (if you don’t have basic technical knowledge) or choose a standard CMS system such as WordPress (if you have the technical knowledge to implement it). For example, our marketing website is based on a standard CMS. The second most important part of your web presence is the internal, members facing web application a.k.a. members web portal. Great UI – It should be modern, beautiful and sleek. Great UX – It should be easy to use. White-labeled – It highlights your brand and not the vendor brand. Useful/Feature-rich – It is “your product” after all. 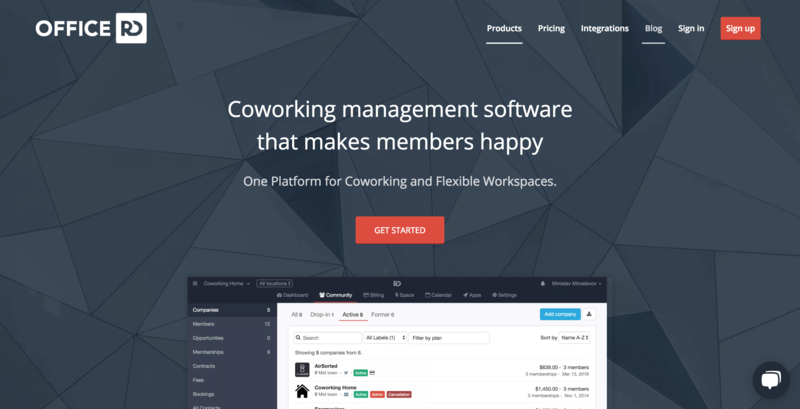 Connected – It should be connected to your marketing website and coworking management software. Internal – SEO is not needed. You can think of your members portal as an important part of your offering, your complete solution. The main/marketing website is located at the home domain – officernd.com, stripe.com, intercom.com, gocardless.com, or any other tech company. The marketing website is always built using a standard CMS. It is owned and maintained by the marketing team and the emphasis is on Design, Content, SEO and the ability to extend it and change it frequently. The members portal, being your web product, is best to live under a subdomain. For the tech companies, that’s usually app.officernd.com, dashboard.stripe.com, app.intercom.com, manage.gocardless.com, etc. Some of the most important reasons for doing this is the so-called ‘Separation of concerns’, as known in the tech world. The product (it’s also called web application and not a website) has its own life. It has its own user interface and its own user experience. It serves a different purpose and it’s owned by a different team – the product team. You don’t want to be caught in a situation where your marketing website is down because the product team is deploying a new version. Or even worse, you need to deploy the product, because the marketing team needs to update a piece of content. There are a million reasons to keep these separate and the most important one is that they serve different purposes. An example internal/members portal (web application). Member signup – your Members Portal should have a public sign-up available to allow a frictionless (and automated) way for prospects members to become part of your community. Meeting room calendar – another great way to capture leads and utilize your space better. Make sure your Members Portal can expose real-time availability of meeting rooms and allow “drop-ins” to book a meeting room with a few clicks. Events page – events are key to improving engagement in your community. Making them easy to spot and exposing them to people outside of your community can bring a ton of benefits. Members wall – your community is one of your top differentiators as a coworking business. Having an up-to-date list of members on your marketing website will help with improving sales AND improving member visibility in general. 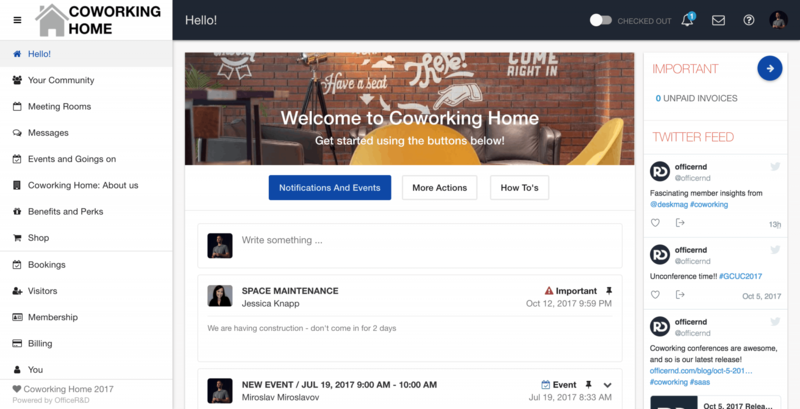 Bonus: Connecting your Marketing Website with your Coworking Management Software – adding an inquiry form to your marketing website (i.e. book a tour form) that is connected to your coworking software can help you save time when dealing with sales. Best case scenario, every time a form is filled in, an opportunity/deal will be created in your coworking management software, so you can keep track of them and follow up promptly. Building the web presence of your coworking space is not an easy task. 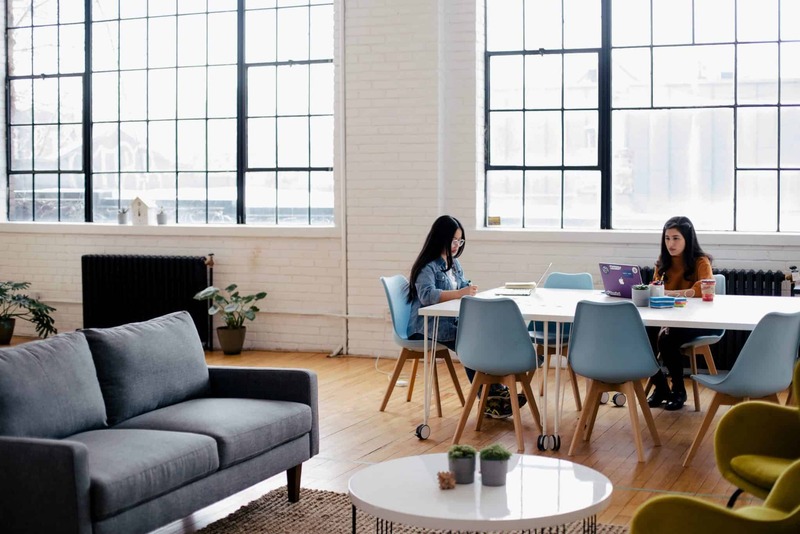 But if you do it right and manage to connect all the moving parts, you’ll have the foundation that will allow you to focus on building a successful coworking community and growing your business.